A picturesque small beach town located 25 miles north of San Diego and 95 miles south of Los Angeles, Cardiff-By-The-Sea is one of the communities within the city of Encinitas. Cardiff-By-The-Sea, though quaint, has been masterfully planned to provide excellent pedestrian access throughout the town. There are trails for hiking, walking, biking, and running throughout the area that connect the beach, lagoon, restaurants, markets, post office, library, and other commercial services within an easy walking distance of each other and the local neighborhoods. 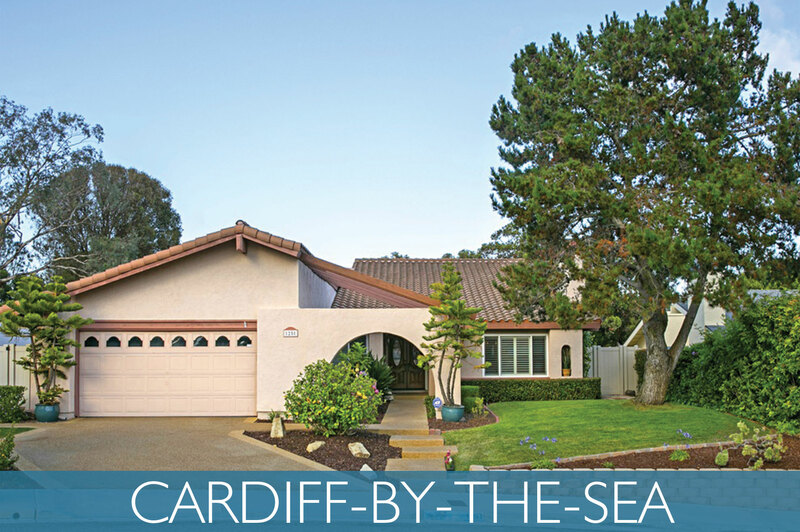 See more about Cardiff-By-The-Sea on Pinterest! Glen Park - featuring tennis, basketball courts, a children's play area, picnic tables, and more. Cardiff Sports Park - featuring multiple sports fields, from soccer, baseball, softball, basketball, and more. Cardiff Reef - featuring a hotspot for surfers...the surf at the reef consistently breaks both left and right and is a huge draw for both professional and amature surfers from all over Southern California and beyond. Cardiff-By-The-Sea is also famous for Seaside Market, one of the best independent grocery stores widely known for wonderful seafood and meat departments; Seaside Market also offers a vast assortment of pre-made items, enabling residents and visitors to enjoy impromptu beach-side picnics at any time. Another local favorite eatery is the VG's Donuts & Bakery, a family owned local store that has been serving Cardiff-By-The-Sea residents some of the most outstanding and mouth watering donuts and baked goods since 1969.